3/11/2018: Nim Rod, despite his name, is a very intelligent dog. He is not cat safe, small dog safe, rabbit safe, let's just say anything smaller than him safe, but does quite well with our other Grey. They are good running buddies.He has caught onto our schedule, for the most part, and learned a few commands. He is very well-mannered and learned to mind the house rules quicker than any other dog so far. eg, stay off furniture, stay out of the kitchen, dog toy vs. kid toy, etc. He knows to go to the garage door when he wants outside, and has done it many times flawlessly. He is good with kids, very gentle, and a really great dog. He even plays with stuffies tossing them in the air and chasing them, even fetches toys and dropping them at our feet. He also crates very well. Telling him to either go to bed or saying cage, he willingly walks right in and lays down, following cues from our other Grey, I suspect. We had him for about 6 weeks now due to needing a few extra vet visits. He had a good dental cleaning and now has nice and white teeth. He has had to have a tooth removed and his rear legs checked out. We've learned that he has both kneecaps shifting a bit, left more than right. This causes him some pain at times, but he does not let it stop him from doing much of anything. Due to this it would be best for him to be in a one-story house. He is such a sweet boy. 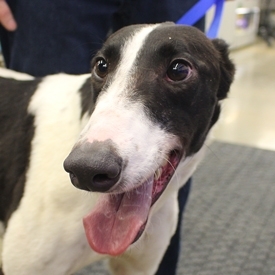 4/3/2018: Nim Rod is a Special Needs greyhound because of his issues with his knees, but really he is just special! Nim Rod just moved to my house as I don’t have stairs except a few out the back door and to the basement (which I don’t let him use). Nim Rod is really incredibly adorable. He is a little guy only weighing 67 lbs. 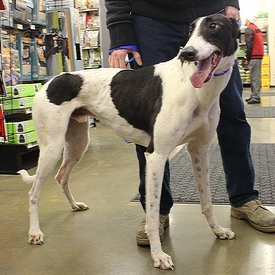 So if you are worried male greyhounds are too big, this boy is the perfect size for you. He is very loving and sweet and wants to please. He loves playing with stuffies and running – apparently the knees don’t slow him down as a pet. His stance and run are a little different, but he gets along fine. He’s doing just fine on hardwood floors. He is an active boy as he is still just 2 years old. What else can I say other than he is the cutest guy. Who will be lucky enough to adopt him?